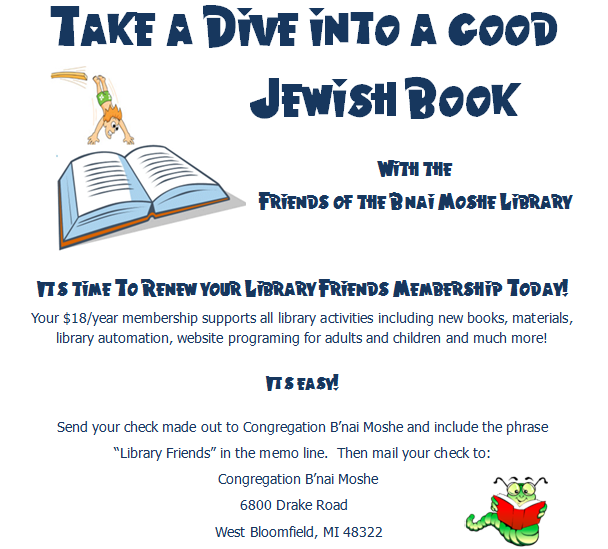 B'nai Moshe's Library is a comfortable and quiet place to read, meditate, study, research or just relax. It is a facility that promotes lifelong reading and study about Judaism, its history, practices and beliefs as well as its relevance to our lives today. It was completely renovated in 2017. The library is fully automated with computer access and a complete reference collection among its over 4,000 circulating items. The library is available for self-serve use and check out during hours the synagogue is open and is staffed by librarian Sherry Wasserman. There is even a Shabbat friendly library cart. The B'nai Moshe Library has joined OPALS, and "open source" library automation provider. Our entire library is located in the cloud and managed through our personalized website. OPALS provides many features you will recognize from using your public library. Look for pictures of the book jacket covers and links to reviews of most of the books. On the home page you will see a list of new titles with direct links to thr catalog record. The home page also provides customized links to other book and education sites. You can register your own account at our OPALS site to place holds and keep track of what you have checked out and on reserve. Visit our B'nai Moshe Library Website today at B'nai Moshe Library.